Being off by one is probably the simplest, most common coding mistake you can make, but it got me this week while I was trying to make tessellating Cairo pentagon tiles for Frank Morgan and his students at Williams College. 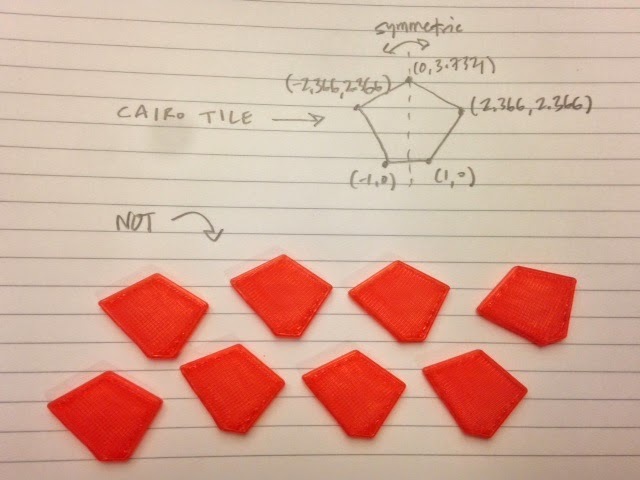 These Cairo tiles are supposed to have a mirror symmetry as shown in the drawing below, but the ones I printed didn't have this symmetry, so I knew something was wrong. The code above is the correct code for the Cairo pentagon; my original code erroneously ran the loop from 1 to 5 instead of from 0 to 4. OpenSCAD thought of the Cairo data set as indexed from i=0 to i=4, so my original loop from 1 to 5 was interpreted by OpenSCAD as taking i=1 through i=4 and then some mystery i=5 datapoint that was not defined. You can see in the picture of the printed tiles that OpenSCAD decided to make this i=5 datapoint the origin (0,0) instead of returning an error. This is one of the things I find most difficult about debugging OpenSCAD code: if I have an error in my code, sometimes OpenSCAD finds a way to compile anyway, either ignoring my code or substituting something it can handle, as it did here.